''THORN' original British make, with dichroic reflector. New. Old stock. Continuity tested. Boxed. Price= £24.00 UKP + £6 postage UK= Royal Mail First Class recorded delivery- Overseas= small packet Airmail. 'Atlas' original British make, pin base with clear cap. New. Old stock. Continuity tested. Boxed. Price= £24.00 UKP + £6 postage UK= Royal Mail First Class recorded delivery- Overseas= small packet Airmail. ''Ekco' British make, twin flanged base with black cap. New. Old stock. Continuity tested. Boxed. Price= £24.00 UKP + £6 postage UK= Royal Mail First Class recorded delivery- Overseas= small packet Airmail. ''Thorn' British make, 4 pin base with clear cap. Quartz upgrade for older tungsten lamps in the Bell & Howell TQ1 projectors. New. Old stock. Continuity tested. Boxed. Price= £24.00 UKP + £6 postage UK= Royal Mail First Class recorded delivery- Overseas= small packet Airmail. 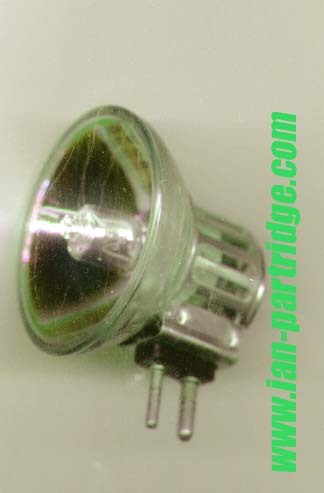 ''Philips' make, 2 pin base down Exciter Lamp Type 6213N for older projectors 5 amp with clear cap. New. Old stock. Continuity tested. Boxed. Price= £14.00 UKP + £6 postage UK= Royal Mail First Class recorded delivery - Overseas= small packet Airmail. 'Siemens' make, A1/7 110 volt 500 watt with black cap. Medium Prefocus P28/25 base.New. Old stock. Continuity tested. Boxed. Price= £24.00 UKP + £6 postage UK= Royal Mail First Class recorded delivery- Overseas= small packet Airmail. PATHESCOPE Projector Lamp " TYP. 6130 C"
''Thorn' British make, with dichroic reflector. New. Old stock. Continuity tested. Boxed. Price= £24.00 UKP + £6 postage UK= Royal Mail First Class recorded delivery- Overseas= small packet Airmail. Links to purchase via Paypal are available for lamps listed above. For availability of other projector lamps and prices please email for a quote. www.Ian-Partridge.Com ~ Web page content photography and design ~ Copyright ©2014 ~ 2019 Ian Partridge.